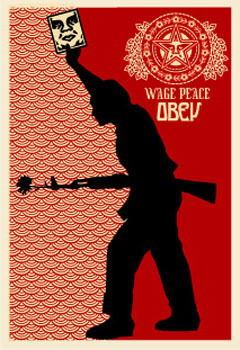 This iconic image (originally used in the 2004 print Visual Disobedience) is one of four large-format prints made to commemorate the release of Shepard’s book, Supply and Demand. Each print depicts an evolution of Shepard’s design and form, from 1989, 1995, 1999, and 2004. If you purchased the entire set, Obey Giant included a signed copy of Supply and Demand. Prints originally sold for $400 each, or $1200 for the set.